The maxim, “Not everything that counts can be counted, and not everything that can be counted counts,”* holds much truth when it comes to “report cards,” but what teachers are mandated to report and also choose to report suggests to parents what many of the priorities are for student learning at each grade. Similar to the way a school’s blog reveals what is important to the school, so does the report card reveal key areas for student learning. What follows then, is both of those things: a blog post surveying some of the learning outcomes found in reports ranging from kindergarten to Grade 7. Prior to the conclusion of each term, I review each report, something I have done enough times now to be impressed by the extraordinary diversity and depth of learning at BICS but not surprised by it. The reports capture just a little of the remarkable experiences students have in their classrooms and beyond learning about interesting and often complex things and using what they’ve learned to, among other things, learn more. In reviewing reports this term, I’ve pulled one learning outcome from each grade as well as an outcome from our wonderful music and learning assistance programs. My hope is that it offers the reader a very brief look at the breadth of what is learned at BICS. In selecting the learning outcomes above, I tried to pull diverse outcomes – math, language arts, performing arts, etc. In reviewing the reports, however, I looked for some patterns that might reveal how our school is doing with some key priorities identified in our School Growth Plan and Aboriginal Education Plan: inquiry-based learning, self-regulation, critical thinking and aboriginal education. There are far more effective ways of determining how the school is doing in these areas – visiting classrooms and speaking with students being one of them – but what did the general scan of K-7 reports reveal to me about these priorities? Learning outcomes about timeless and transferable concepts and references to “Fascination Time,” “Genius Hour,” and “Passion Projects” made it clear that students were pursuing inquiry, whether it be teacher-led or open inquiry, often. In opening comments and in various sections, it was obvious that not only is self-regulation a key feature of each classroom at BICS, it is also being reported on frequently. Whether it be found in socials studies or explicit references to the “Thinking Competencies,” it was obvious that developing students’ skills as critical thinkers and asking them to uses these skills is a key area of learning. Lastly, students are learning about Indigenous Peoples frequently. Whether it is in Language Arts learning about oral stories teaching about the land, or learning about cultural characteristics and traditional ways of life in Socials Studies, the many references to Aboriginal Education found in BC’s new curriculum were also obvious in the K-7 reports. I am proud of our School’s progress. And in reading reports, I can’t help but feel a strong sense of satisfaction in knowing that each of the many bullets on a report card, simple words on a page, had some powerful learning experience behind it – perhaps a beautiful work of art, a field experience to a National Historic Site, a memorable visitor, help from a dedicated staff member, or simply a student’s persistent effort – and that each of these experiences provided a sense of accomplishment and the satisfaction of learning. *This quote is attributed to both Albert Einstein and the sociologist, William Bruce Cameron. How many times can a problem be solved? If the answer is available to everyone, can it be solved more than once? Is there any point in asking students to solve problems where not only has the answer been found but it is available to anyone with digital access and the skills to find it? Should efforts in education be directed more towards students developing their skills to locate previously found answers than to solving problems for which solutions already exist? Surely students should be problem solvers too so should students spend their time solving problems that already have available solutions or apply these solutions to the next step of the problem or to some unique situation? These are the questions I was left with after listening to Daniel Pink’s keynote address and Alan November’s session at the FISA BC 2016 Convention. Pink suggested that problem solving is a useful skill but that problem finding is a more useful skill. November suggested that internet tools exist to share not just information but knowledge and more of students’ time should be spent using this knowledge to solve new and unique problems rather than simply rehearsing the solutions and steps identified by previous learners. November spent much of his presentation discussing the power of the knowledge engine Wolfram Alpha which doesn’t just access information as stored (as a search engine does) it re-sorts it, remixes it. Essentially, November suggests, it turns information into knowledge. So with such tools as Wolfram Aplpha, the question arises: What aspects of the knowledge base are suited toward archiving and accessing when appropriate and what aspects are essential for students to know and understand so that they can understand themselves and the world? In other words, what learning should be repeated, generation after generation, and when is it appropriate to simply start with what is already known and go from there? Is it necessary for students to always start at “square one”, or is it possible to enter the subject at a later point and find the knowledge that has been created before and take it further. The question is directed more towards content than foundational skills. Each generation needs to learn to read and write; there is no mechanism to pass that on through the internet. But when there is a mechanism, the question of whether what is being learned is actually helpful must be asked. For years, not just in the Big Ideas of BC’s new curriculum, a shift has been underway to develop understandings, not just acquire knowledge. But with the development of tools to access the learning of others, and more importantly the ability of students to, in Daniel Pink’s phrase, curate this information, the speed of the shift may accelerate. So beyond inquiry-based learning and developing understanding, what does that look like? November suggests that students should spend less time solving problems and more time learning about topics that involve a concept or idea. He notes this idea has been foundational to the teaching of the US Military Academy at West Point for decades. The difference is that instead of solving a problem related to volume, the student creates their own problem that involves volume. Doing so allows the student to take what is already known to both create and solve a unique problem, essentially building on the knowledge of others rather than simply repeating it. More time is spent applying knowledge; less time is spent recreating it. Clearly a level of general knowledge is needed to understand the world. Nevertheless, as we become increasingly confident in the internet’s ability to store information and knowledge (think about Gmail and Outlook archiving emails instead of deleting them) and students develop greater abilities to access information and knowledge, educators may become increasingly comfortable with students using what is already known to solve new and unique problems rather than simply repeating the steps established by others to solve a problem. In the age of the knowledge engine, the question, “Do students really need to learn this?” has become even more complicated and pertinent. This post was originally published on the BICS Blog. That statement certainly holds true in education, perhaps now more than ever. Last week, BICS Vice-Principal Laura Magrath and I spoke to parents about BC’s New Curriculum as part of our BICS Open House. Our staff has been learning about and working with what until recently has been termed the “Draft Curriculum” for two years and I have been sharing information with our BICS PAC and writing blog posts on the topic since November 2013. But the “Draft” stamp has recently been removed from the curriculum and it is now referred to as the New Curriculum so we felt it was a particularly important time to share aspects of the New Curriculum with parents; particularly three important changes. This post summarizes some of the key messages of that presentation. For the 2015-2016 school year, both the “old curriculum” and New Curriculum are usable documents. In 2016-2017, what is taught in Kindergarten to Grade 9 classrooms will be based on the New Curriculum only. 1. Content – What Students Understand And Know à Start with the big picture. The “old curriculum” was organized by themed learning outcomes. For some time, teachers who have taught with an inquiry-based approach to learning have tried to discern the essence of the learning outcomes. Teachers would find themselves asking, What’s the big idea here? Beyond facts and figures, what is the concept or understanding that students will take away from this unit of study that they can apply to future learning situations? The New Curriculum starts with the big picture. 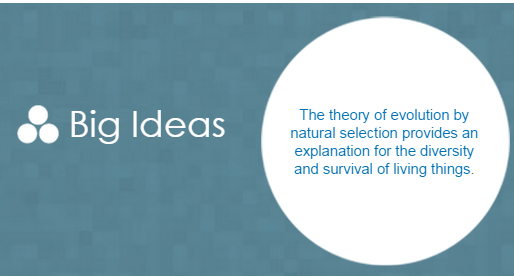 Ideas and theories are presented as Big Ideas and from there the content, which is used to develop an understanding of the Big Ideas, is articulated. As suggested by the name, Big Ideas are greater than what can be covered in one subject in one grade. So, many Big Ideas are repeated throughout many grade levels as students develop more sophisticated understandings of theories and ideas. 2. Competencies – What students can do à Competencies are key. While all people need a level of general knowledge to understand themselves, others and the world, knowledge is easily lost; skills less so. For example, most people likely have forgotten many of the facts, figures and ideas they learned in Grades 1 and 2, the age when they were learning to read. But people don’t forget how to read. In the New Curriculum, Competencies are key. The content, while still worthy in its own right, is a vehicle to develop two types of competency. The first type of competency are the Core Competencies – Communication, Thinking and Personal and Social. The Core Competencies are not subject or grade specific. It is thought any learning activity can demonstrate and develop some or each of the competencies. As learning is a lifelong endeavour, the competency continuum is also lifelong. As part of our transition to the new curriculum, in terms two and three of the 2014-2015 School Year, many BICS teachers used language from the Core Competencies in their opening comments. However, the report card looked identical to previous terms and did not reflect the changes that have been made to the curriculum. Kindergarten and Grade 4 reports will look very different in 2015-2016 offering space for Core Competency and Curricular Competency assessments. Further, as reflecting on learning is essential, there is space on the new reports for student voice and reflections. Further information will be shared by Director of Instruction for West Vancouver Schools Lynne Tomlinson regarding a change of reporting for Kindergarten and Grade 4 students in 2015-2016, and a change for all elementary school students in 2016-2017. While this curriculum signals a major change in BC education, it is also a response to the innovative work being done in classrooms across BC including BICS. The Curriculum will support the work we started long ago – inquiry, self-regulation and critical thinking – and also push us to examine and evolve in other areas of practice. Change truly is the only constant in life, and so to in education. In January of 2005, I started my teaching career at Bowen Island Community School. It was a temporary assignment, just six months, teaching Grade 6-7. After leaving BICS, I taught Grade 5 for several years at Ridgeview Elementary School before returning to BICS as vice-principal in 2010 to carry on my teaching career and begin my career as a school administrator. Now, in January 2015, I have the honour and privilege of leading BICS as principal. So, in many ways, BICS has been a place of beginnings for me. But will the change of principals at BICS be a new beginning for the school and, if so, a beginning of what? At first thought, it might seem ungrateful and naïve to suggest that the school will carry on just fine without the thoughtful guidance and inspirational leadership of BICS’ now retired principal, Jennifer Pardee. But so much of Jennifer’s work at BICS was to create a shared vision for the school involving students, educators and the community and to build capacity in staff to pursue innovative approaches to teaching and learning. So, while Jennifer will be deeply missed by the BICS community, professionally and personally, much of her leadership has been to foster conditions for continued success after her retirement. Over the years, I have heard BICS described as a “moving school.” A moving school is one that has very clear priorities and where there is buy-in from staff to develop and implement strategies and tactics to achieve those priorities. In other words, a “moving school” is an improving school. Current research, insights from experience, as well as technological innovation, have created many opportunities for schools to move forward on several key initiatives. At BICS in recent years, there has been a greater focus on social and emotional learning, aboriginal education, self-regulation, and a restorative justice approach to student conduct; there is increased access to digital technology, and our school iswell on its way to an inquiry-based approach to learning where students practise and develop critical thinking skills and mindset. We are certainly not at the beginning stages of any of these initiatives but they will each continue to guide the work we do for years to come. I will use this blog space, as Jennifer and I have done over the last several years, to write about our school’s progress. So there is much to be continued, but there are other changes on the horizon in BC education; there are new beginnings. The BC Ministry of Education has released a new curriculum, currently in draft form, that BICS will transition to in coming years. The curriculum is a major redesign that articulates what students are to know and understand in a way that supports inquiry-based learning (I have written on this aspect of curriculum here), and will change the way student learning is communicated with a focus on three core competencies – Thinking Competency, Communication Competency and Personal and Social Competency (I have written on this topic here). Our school is well-positioned to transition to this curriculum as we have been focusing on many of its core elements – inquiry, critical thinking, flexible learning environments – for years. What students need from their education to be successful in a rapidly changing world and insights into how people learn means that the vision for BICS will continue to evolve as we strive to provide students with the most relevant and effective learning experiences we can. But as the BICS staff is deeply invested in many initiatives, at this time of transitioning principals, at this time of a new beginning for me, consistency for the school in pursuing the initiatives in which we are immersed, in doing them as best we can, is needed. Change is certainly upon us at BICS, but change is nothing new in a moving school. 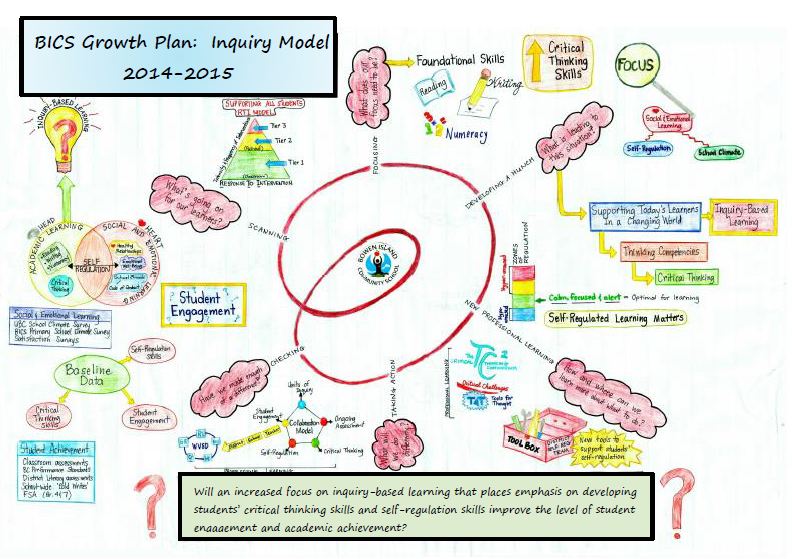 Professional Growth Plan, 2014 – ? My professional growth plan is very much linked to school growth plans. All schools in BC must prepare a school plan that sets one or more school goals for improving student achievement, the strategies to achieve these goals and the measures for determining success. It is one thing to measure school growth and improvements in student achievement, it is another to trace results to causes. Schools are not science experiments where one variable at a time can be added and tested. With many teachers and many strategies all at play each year, it is not difficult to acquire data on many areas of student achievement – such as literacy skills – but tracing this growth to the strategies of teachers in a variety of classrooms is difficult. Will an increased focus on inquiry-based learning that places emphasis on developing students’ critical thinking skills and self-regulation skills improve the level of student engagement and academic achievement? The question examines the affect inquiry-based learning and critical thinking have on student engagement and academic achievement. As BICS has also focused on self-regulation, digital access for students and teachers, environmental education and place-based learning, tracing improvements in student engagement and academic achievement to any one cause is perhaps impossible; and perhaps unnecessary. Inquiry is a study into a worthy question, issue, problem or idea. It is the authentic, real work that that someone in the community might tackle. It is the type of work that those working in the disciplines actually undertake to create or build knowledge. Therefore, inquiry involves serious engagement and investigation and the active creation and testing of new knowledge. The strategies and approaches of environmental education and place-based learning, where students learn in the community and look at issues or problems facing the community and world, is very much aligned with the definition of inquiry as described above. Further, digital access, far from being a strategy in its own right, can be viewed more as an effort to support inquiry by providing students with as much opportunity as possible to delve deeply into a topic, beyond the opportunities people, places, and print found in the community and library might offer. Digital access also allows students to share their inquiries with others. With access to so much information, the ability to assess the reliability of information and make sense of it, core tenets of critical thinking, is vital. In this way, through inquiry, students practise critical thinking skills rather than just learn what it means to be a critical thinker. This practise of critical thinking is core to the philosophy of the Critical Thinking Consortium, which has helped guide BICS’ work in this area. Self-regulation, in the words of Stuart Shanker, is the ability for students to be calm, alert, and learning. It is perhaps the foundation for any other strategies a school might wish to implement. Inquiry is pointless unless students have the capacity to be engaged. What does it mean for someone to be engaged in learning? What factors (culture, strategy, tactics) lead to learner engagement? How can you tell whether students and teachers are engaged and can engagement be traced to particular strategies (inquiry, digital access, self-regulation), tactics or attributes of a school’s culture? As I begin my inquiry, I am becoming more and more aware of the challenges of isolating strategies and determining their individual impact. Self-regulation, regardless of what other strategies a school might have in place, has tremendous power to improve student achievement. But it is already bundled together with other strategies our school is pursuing. It may not be possible to weigh the individual impact of various strategies but I am looking forward to learning more about measuring results from the formidable combination of strategies at work at BICS. This post was originally shared on the BICS Blog here. At BICS’ first Parent Advisory Council (PAC) meeting of the school year, I had the privilege of sharing my excitement for the year ahead by speaking about BICS’ 2014-2015 Growth Plan. This is a tremendously exciting time to be in public education. More than any other point in my ten years as an educator, I feel there are incredible opportunities to improve learning for students. Below, I share some of the strategies in our school’s Growth Plan as well as the provincial context. The Ministry of Education and teachers across the province have also worked together to develop a new curriculum, still in draft form, which was introduced in the fall of 2013. The curriculum supports teachers to utilize an inquiry-based approach to teaching and learning. Teachers now have access to planning documents that organize the understandings students are to acquire around big ideas that are in many ways transferable from subject to subject. Furthermore, curriculum is designed to develop previously gained understandings and lay the groundwork for subsequent learning. And students are able to support their inquiry by connecting with people, places, print and digital media. BICS is filled with passionate educators and volunteers who inspire students. Bowen Island has incredible opportunities for students to learn from their environment. The BICS library is filled with a broad range of resources, and our school has 80 portable devices. This year, students in Grades six and seven have been encouraged to bring in their own devices so that student can access a vast and current variety of resources to support their inquiries. In speaking to the BICS PAC, it was hard not to overuse many of the buzzwords in education that I used above which are core to the work of BICS and the West Vancouver School District: Inquiry, Digital Access, and Self-Regulation. But these words, which represent pedagogical strategies and tools, quickly lose significance if they are not connected to the goals they are to achieve. In my ten years as an educator, I have distilled three simply stated yet anything but simple goals for students: that students love learning, learn a lot, and see and seek opportunities to put their learning to use. These goals guide my decisions as an educator but they are too vague for planning purposes. More specifics as to the objectives for student learning, particularly what “learning a lot” means, is offered in the new draft curriculum. In addition to supporting teachers with utilizing an inquiry-based approach to learning, the new curriculum articulates very clearly the concepts and big ideas students are to understand and also the competencies students are to develop. In an information rich society, it is becoming less important for students to know a plethora of facts and details. What is becoming increasingly important are competencies that help students make sense of the ubiquitous information they are surrounded by and to provide them with the skills necesseary to adapt to an ever changing world. The Ministy of Education has articulated three Core Competencies which the Ministry asserts, “are vital to personal and social success, life-long learning, and to the changing workplace,” so a student’s development of these abilities are core to their quality of life. The Competencies include Communication, Thinking and Personal and Social Competencies and I have written on these competencies here. While it is still important that students acquire a general level of knowledge that allows them to understand the world they live in, the essential goals of the curriculum are the “Core Competencies.” Reporting is likely to shift in the next year to reflect the changes in the curriculum. With a greater understanding of how people learn, access to traditional and new tools for learning, and with the introduction of a curriculum that assists teachers with planning and effectively articulates the goals for student learning, change is very much upon us in BC education and very much so at BICS. Change is challenging, but is far more comfortable when we recognize and understand the goals we are working towards. Much has been made of Parks Canada considering Wi-Fi access at many National Parks across the country. Many videos are appearing on YouTube warning cellphone users of social networking leading to people having poor social skills and hollow friendships. 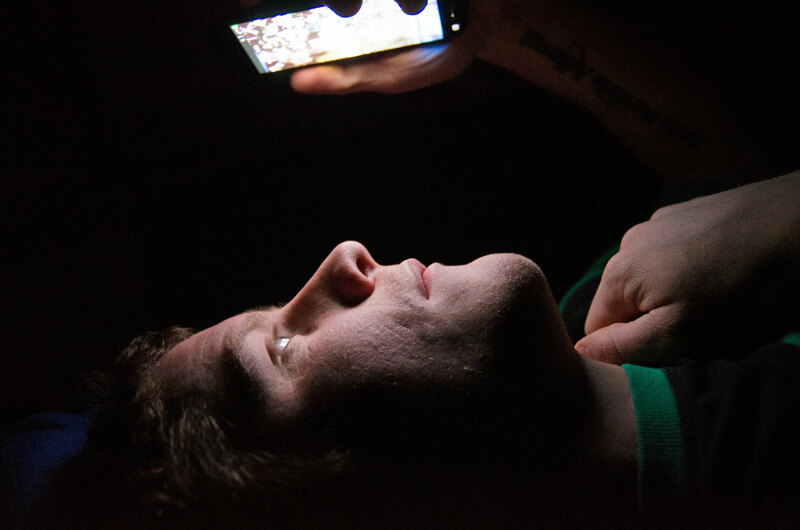 Concerns are being raised about adolescents not attaining sufficient sleep due to texting late at night. The more I learn about concerns with screen time, the more convinced I have become that schools need to offer students screen time, in part to teach them about the purposeful use of technology. Screen time must not just lighten the faces of students but enlighten their minds. Beginning next school year, BICS students in Grade 6-7 will be encouraged to bring their own device to school. While many parents will see great value in supporting inquiry with digital access, others will wonder if this will simply mean students will have more and more screen time, at the cost of other important learning experiences. For this reason, it is important that we start conversations around “bring your own device” (BYOD) by asking why: Why is it helpful for students to have devices? There are many reasons but I will share four. First, most schools in British Columbia have moved or are moving towards an inquiry-based approach to learning where students ask questions that guide their investigation into a subject. To do this effectively, students need a window beyond the classroom; they need access to a variety of up to date sources of information and varied perspectives made available through online resources as well as more traditional research approaches. Second, learners need an audience. Too often students share their learning with an audience of one, their teacher, or a small audience – typically family members. Class and school presentations happen infrequently, but there are frequent opportunities for students to share their learning in blogs or online presentation tools. This kind of sharing increases accountability and engagement. Third, learners need a place to store their work. The BC Curriculum is providing more opportunities for students to connect learning among subjects and between grades and a digital portfolio of learning is helpful. Lastly, students need to learn that technology is a tool, not a lifestyle. Like using a calculator, it can be taken out for a purpose, and put away when unneeded. Students need to learn how to use this tool and be good digital citizens: how to use information ethically, comment on each other’s work supportively, and stay safe online. These four points are part of the answer of why digital access supports student learning, but as BICS has parent and grant-purchased computers, one might wonder why students need their own device. The simple answer is that a student device can be used seamlessly: they have access to it whenever it is needed, not just when their teacher has booked the computers, they are familiar with how it operates, and they can save work to their files and access them from home easily. The devices the BICS PAC has invested in over the last four years are used consistently and it is becoming increasingly challenging for teachers to reserve them for classroom use. Encouraging students to bring in their own electronic device to school will reduce the demand on school devices and increase accessibility to support learning in a more streamlined, seamless way for all students. This creates greater flexibility for students to use devices when it best suits the class schedule, rather than when the teacher can book the computer cart. I have not been easily convinced of the need for BYOD at BICS. As noted, our PAC has invested heavily in a variety of devices and, up until recently, teachers have found these devices have, for the most part, satisfied demand. I also share concerns with parents over the cost for families’ buying devices. I understand that parents greatly value the many learning opportunities of BICS students that have little to do with technology such as learning from people who have insights that will never come up in a Google search. But I also know that the balanced use of technology does not devalue other forms of learning. And far from wiping our school goals of critical thinking and inquiry-based learning off the table, digital access is the table, or part of it; it enables inquiry and provides opportunities for critical thinking. On Monday, May 26th at 6:30 pm in the BICS library, I will share a presentation on BYOD elaborating on the benefits and addressing concerns. Parents who will have children in Grades 6 or 7 for the 2014-2015 school year are strongly encouraged to attend this interactive session. Other interested BICS parents are of course also welcome. After the presentation, I will invite parents to begin a conversation on BYOD that will shape implementation in September. Please feel free to start the conversation now by commenting on the ideas shared in this post.